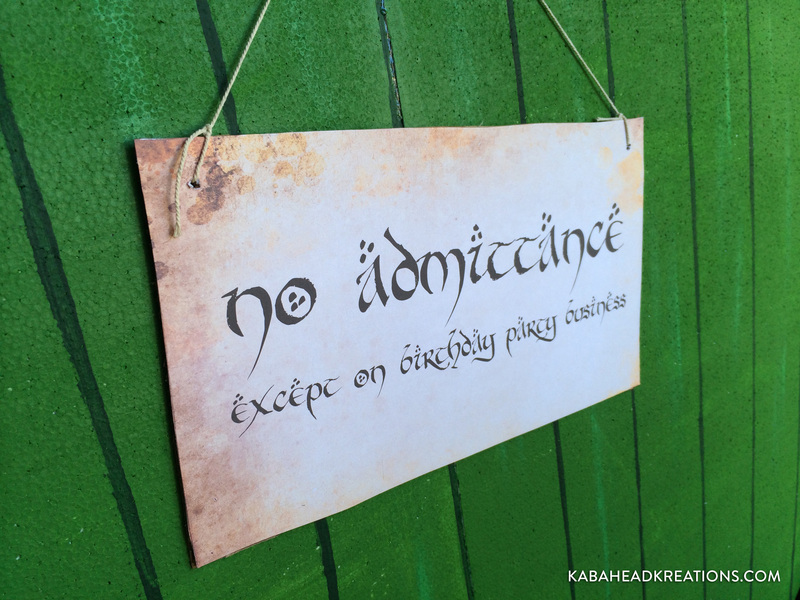 When my sister Kaycee turned 30, she wanted to have a LOTR themed birthday party. Thankfully I am also a LOTR fan so I was super excited to bust out my inner “Ringer” and start planning. A little backstory: When the first trilogy was released, Kaycee had a strange obsession with Legolas and his flowing blonde hair. One day when I was at Rite Aid, I found a life-sized cut out of him on sale so I bought it and she has had it propped up in her room for years (a little freaky, yes). Her love for Legolas waned for a few years until the Hobbit trilogy was announced and Legolas was written in (thank you Peter Jackson). – Three 1-inch 4x8ft foam insulation panels from Home Depot, or similar hardware store. They’re between $15-$30 each depending on the brand/quality. – Green and black water based paint: I was able to get away with using only 1 container of the “sample” paint from home depot. For the black paint (used to draw the lines on the door) I used some leftover black acrylic paint I had lying around. – Beige water based paint: We had leftover Behr ultra beige paint from painting our home so I put it to use painting the surrounding door walls with it, so no extra money there. If you need to buy it, I would buy at least a quart. – Red paint and sponge: This is for the bricks that frame the door. – Foam cutting tool like this. Definitely a must. Don’t try to cut this kind of foam with a knife, or little white foam balls will flake off everywhere. – Brown cardboard box: I order from Amazon all the time so I always have some recyclable boxes handy. 1. Begin by measuring the area where your door is going to fit. On our porch, the opening is a little shorter than 8′ so I had to cut off a few inches off the foam boards to get it to fit. 2. Using duct tape, tape the two pieces of foam together every 10″ or so against their long sides (thus forming one big piece of foam that is 8’x8′). No need to go crazy with the tape because you will need to remove it. 3. Next you need to draw out the circle which will be the actual door opening. Make your own protractor with a yardstick (or similar), pencil and sharpie. Most metal measuring sticks have a hole on one end. Stick your pencil in this end and tape the sharpie at the end (Note that my “yardstick” is actually only 30″ long so if you use a traditional yardstick and want to follow my dimensions exactly, you’ll have to tape the sharpie at the 30″ mark, NOT at the very end). 4. Next, remove the tape from step 2 and separate the two foam boards. Cut the foam along the sharpie lines you just drew, using the foam cutting tool. Remember my note from above: this foam cutting tool is a must. It’s not too expensive. If you try to cut this kind of foam with anything else you’ll have a big mess and a jagged cut. 6. Next, join together the half circles by gluing the seam with a hot glue gun (sorry I have no photo of this step). Hot glue bonds foam really well. After you do this, you should have a full circle for the door. Next, glue the other two pieces together at the seam, which will create the wall/door frame for your circle door. After you’ve finished hot gluing, now it’s time to paint! Paint the circle door green using ONLY WATER BASED PAINT. Spray paint does not work on foam because the chemicals in it eat away at the foam. Next paint the wall/door frame beige or light brown. 7. After the green paint dries on the door, use a long straight edge and paint black lines about 6″ apart on the door. Hint: Paint the seam black and then work your way outwards. That way, the seam blends in to the design. 8. After all paint dries, place the door inside the wall/door frame. Looks pretty good already! 9. Now it’s time to make the bricks that surround the door. I used recycled shipping boxes and sponge painted them with red to give it that brick texture. Then cut them into rectangles about 8-9″ long. Snip the corners a little so the bricks aren’t perfect rectangles. 10. Next, glue (using hot glue) the bricks down so that it lines the door opening, spacing them out ever so slightly so that none of them are touching. I used exactly 50 bricks for the whole circumference, but you may need more or less depending on how big your bricks are. 11. And now, the hard but most rewarding part: Hanging the door frame and door. I first wedged in the door frame under our porch overhang. To make sure it didn’t fall back, I had my husband build a simple support out of 2x4s that I duct taped to the back. When It came time to think of favors, I immediately thought of the little lembas bread packs that the Hobbits carried with them on their journey. I searched high and low for individually-wrapped madelines that did not cost and arm and a leg and finally found them a the business Costco near my house. I found a template online for the leaves and edited it in Photoshop so it would fit the madelines. Then we wrapped them up and tied them with string. My sister loves tea so I bought a bunch of tea boxes from Sam’s Club to use as prizes for the games, because who wants to play games at a birthday party if there are not prizes?? I made custom wrapping paper from a map of Middle Earth that I found online. I printed out the map on my wideformat printer (13×19″) and wrapped each box. Clearly I got lazy after making the door and didn’t document my process with the other aspects of the part. 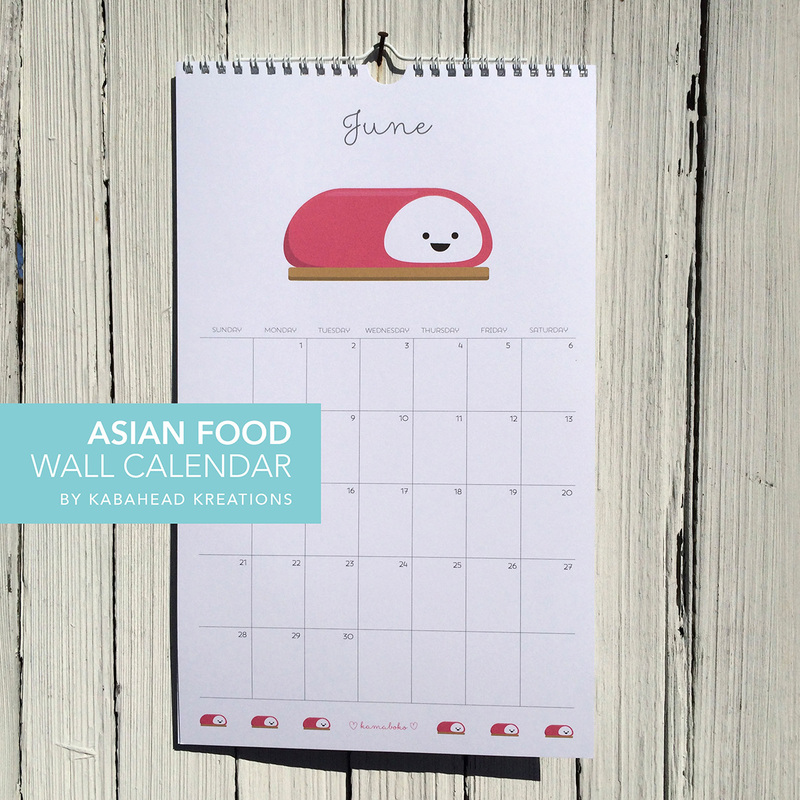 Every year customers ask if I’m ever going to make a wall calendar. The answer this year: YES! HOORAY! 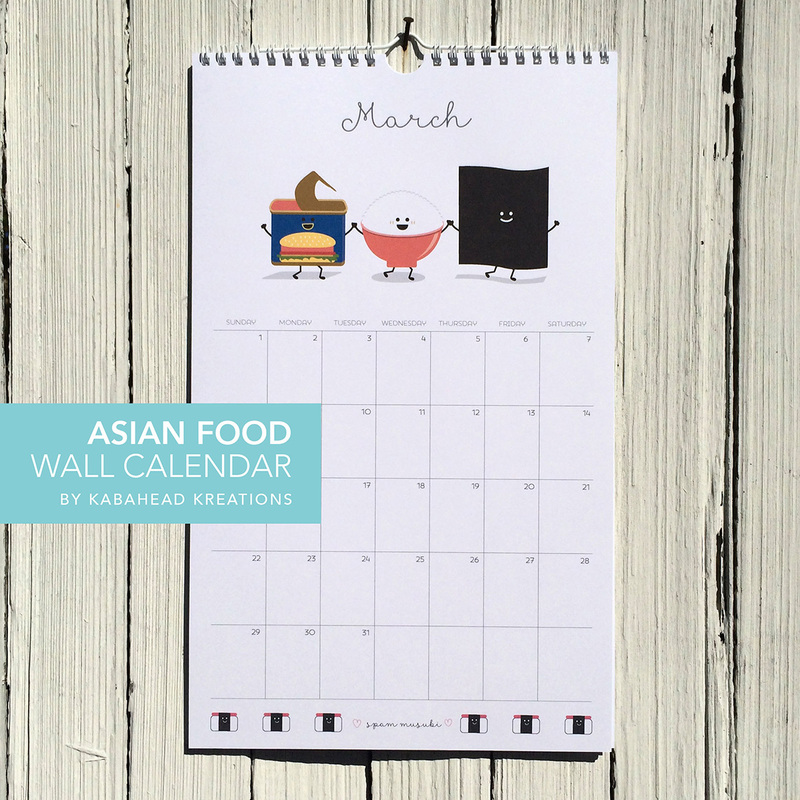 I finally sat down and designed a unique wall calendar of cute Asian foods. 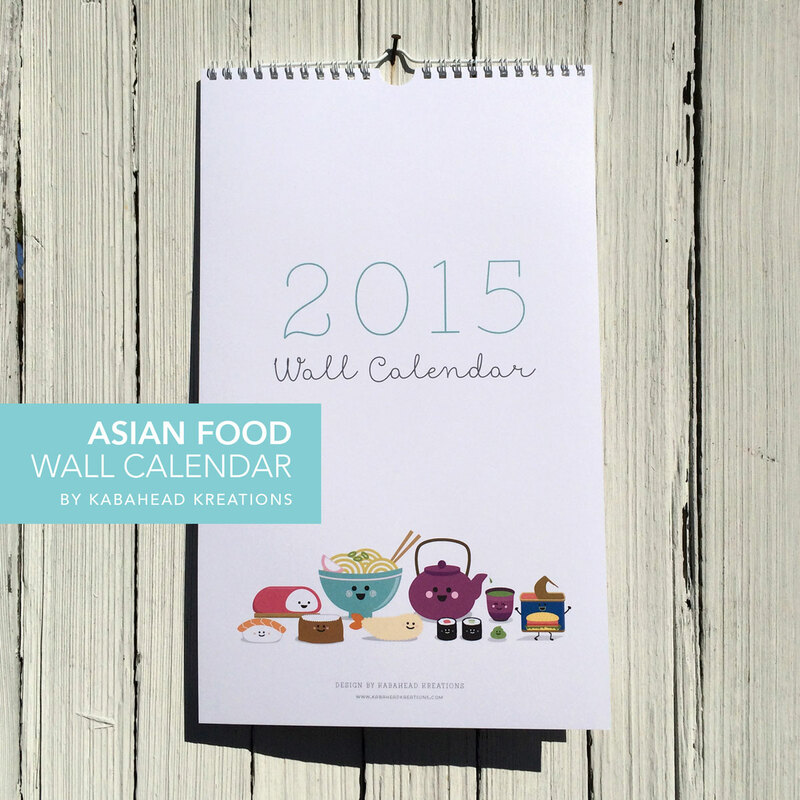 It measures 8.5×14″ and is printed on 110# white index stock and is hand-bound and packaged. I’m only doing a small run, less than 50. 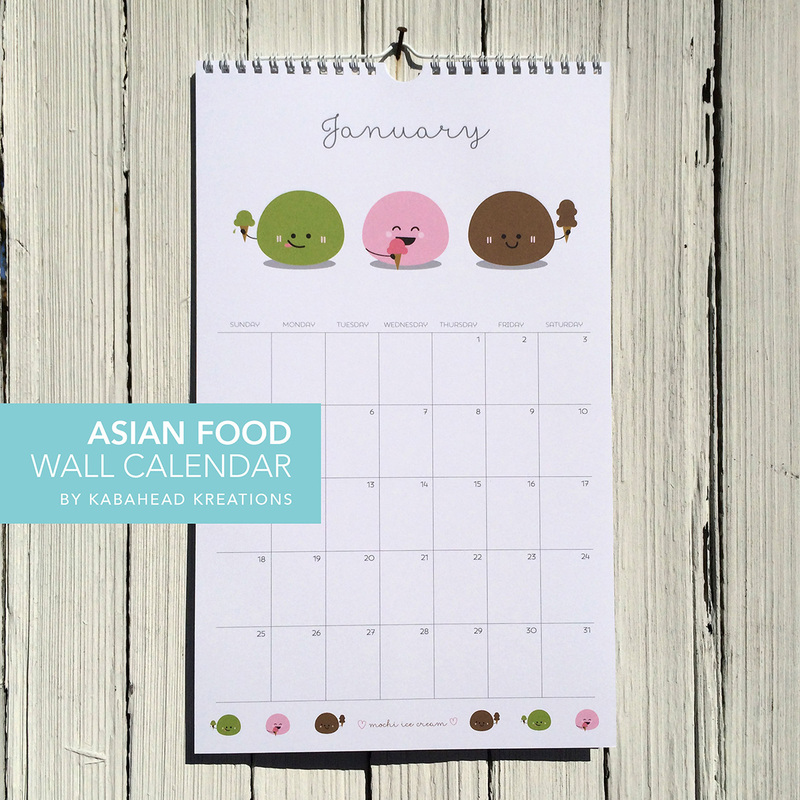 These will be sold exclusively at my craft shows so if you want one, come early (they will sell out fast!). For our friends’ (Mai & Dale’s) wedding I was asked to make a cake topper. We all thought it would be cute to make characters of a Korean groom and Vietnamese bride wearing their traditional wedding outfits (hanbok and ao dai). 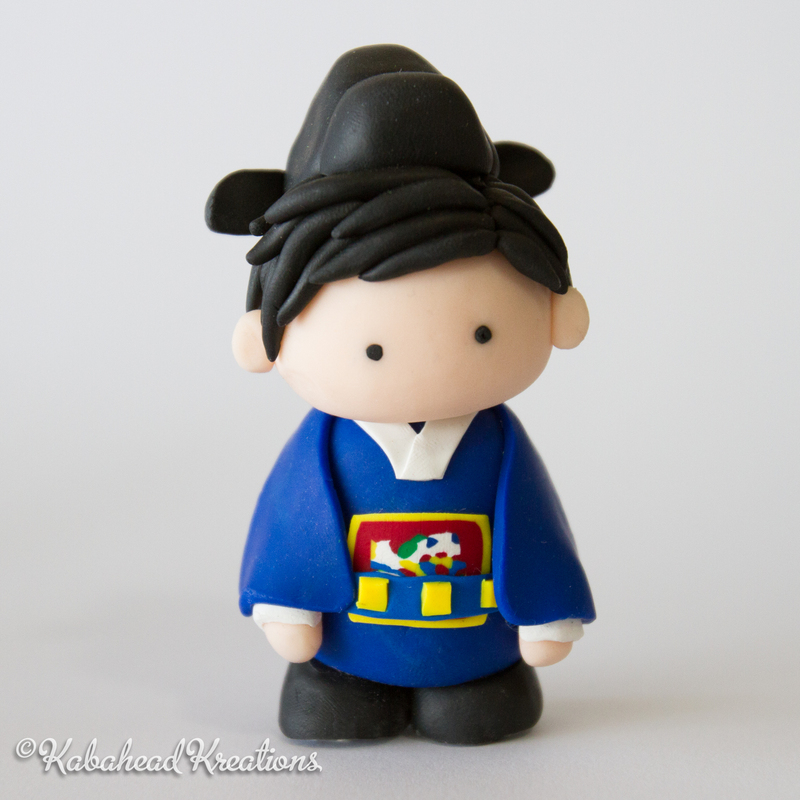 Below is the groom wearing the traditional wedding hanbok (hat too!). The pattern on the chest was made using the same technique as Millefiori beads–I wrapped a bunch of colors together and then sliced a piece off. Here is the bride wearing the Vietnamese wedding ao dai and khan dong (hat). I made the hat by rolling several strands of red and then squishing them together on top of a plastic Easter egg to keep the shape. And here’s their shiba inu dog who also made an appearance on the cake! After making my own wedding cake topper in 2009 I learned that it’s best to adhere each of the characters on top of a flat platform, which will allow them to sit nicely on the cake without frosting getting up in their feet, etc. I made a white platform out of some extra fimo clay and rolled it out to about a 1/4″ thickness, then baked it. I adhered the little figurines to it using earthquake putty so that they could be removed later, if desired. The final figurines stand about 3.5″ tall.